Here's the thing, if you don't prepare, YOU SHOULD FEEL NERVOUS! Unless you are thrown in to a crazy situation, there are a few things that you should always do before performing in front of an audience or at an audition. – Learn your music/monologe. And bring it with you neatly prepared in a book. Here's a post about putting together an Audition Book. Here's a post about finding a song. Here's a post about finding a monologue. – Mark your music for your accompanist. Check out these posts about helping your accompanist to be your best friend. – Do your ACTING HOMEWORK! Check out my free e-book 6 Steps to Acting with Less Effort it will really help you to make specific choices and get out of your head. You should know exactly what happens in the world of your character before you start singing/speaking (your moment before), know who you are singing/speaking to, know why you are singing/speaking (what you want/your objective), know how you are going about getting what you want (your tactics). If you know those things, you will have substance that will ground you into your material. – Arrive early. If you are running around like a crazy person before you perform, you'll be setting yourself up for a wreck. Give yourself time! FYI. I need to work on this one! I'm always saying yes to too much and squishing my commitments together. Try to allow at least 15 minutes more breathing room than you think you need if you are an over committer like me. – MARKING IT – If you are singing a full crazy belt piece or a monologue that requires high volume or emotion, it's a good idea to run it at 1/2 energy just to get it into your body… but that is not enough. You mustn't stop there. – FULL OUTING IT – Ha! Like that term. Disclaimer – Running through an athletic piece over and over again will only make you tired, and it came be damaging. Mark it first to make sure you have the technicalities right, and then give it a good 1 2 Punch! Run it FULL OUT. If you are going to wear heals when you sing, wear heels when you practice. If you will be holding a mic, grab a water bottle and pretend. – SINGING IN FRONT OF AN AUDIENCE – I can't stress this one enough. There is a physical change that happens to us when we are in front of a crowd. The only way to get better at handling the stress that singing in front of an audience causes us is to DO IT. – DO IT! Get out in front of an audience with live musicians as often as possible. Jump on EVERY chance you have to perform. In NYC there are loads of performance opportunities. Here, in Southern California, it's a little more difficult. I searched everywhere looking for a spot where my students could get more stage time and that's why we created the Ghost Light Vocal Jam – A Monthly Broadway Open Mic at the Chance Theater. Wouldn't you rather flub up on your words in front of a relaxed crowd at an Open Mic or even… at a Karaoke Bar than at a super important audition? And… it is REALLY different performing with a piano. So, while a karaoke night is a great start, finding a LIVE piano player is really the best. If you are in So-Cal join us for the Ghost Light Vocal Jam! Click here for more info. Once you are up there, ready to go. 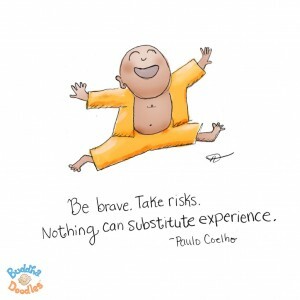 Accept the fact that you are nervous. Don't try and fight it! It will only make it worse. – Breathe from way down in your belly and when you exhale – don't just release the air like a deflating balloon. Release the air with purpose. Imagine that you are filling the room up with all sorts of awesome, powerful, amazing, shimmering energy. Just with the power of your breath! Allow that breath to fill you with awesome as well. Allow it to support you. – Know that you have put in loads of work and you are ready! If a disaster happens, you will recover. It's not how you fall, it's how you get up! Most people in an audience know that it is DANG HARD to get up on stage in front of a crowd. If something crazy happens, they will have empathy. – Remember how LUCKY you are to be able to be this brave human who is sharing their craft. People dream of having the guts to get up and do what you do. Be proud of that! – Love every moment. Love the nerves. Love the crazy of it all. It's a rare and beautiful thing we get to experience when we are in front of an audience. There is only one thing you have control of and that is what you deliver. Not what anyone else delivers. Stop worrying about the audience. you have no control over them. – Before you head onto the stage or the center of the audition room, make a list of 3 technical reminders that will help you in your song/monologue. This list will be different for each person and different for each piece you are working on. Before you sing, remind yourself of those 3 techniques. You could say to yourself: Breathe from my belly. Drop my jaw. Use vibrato intentionally. Once you remind myself of those things… LET IT GO. – Right before you sing/speak connect with your moment before. Your “moment before” is what happens in the world of the character directly before you start signing or speaking. If you have a strong story and a strong specific connection to your story, this moment before will lock you into your piece as an actor. Once you've connected to your moment before… LET IT GO! – Remember that performing in front of an audience, no matter the size takes ENERGY! If you are not willing to bring it, why are you doing it. Yes, you want to be relaxed and having a great time, but you also want to stay in it. I've seen people who just turn off and tune out. Do not be a tune outer. : ) Make a commitment to stay in it and then share your awesome gift with the audience… LET IT GO! Really, if you don't find joy in performing, it's going to be very difficult to maintain the drive an passion that it takes to be a performer. If you hold on to the little things that you “messed up” or wish you had done differently, you'll be tormented and then you won't bring your best self to your next piece. Check in after you sing, make a note on what you did that was awesome and what you did that could be improved and then, LET… I think you get the message. I recently fell in love with an artist named Molly (Ha!) 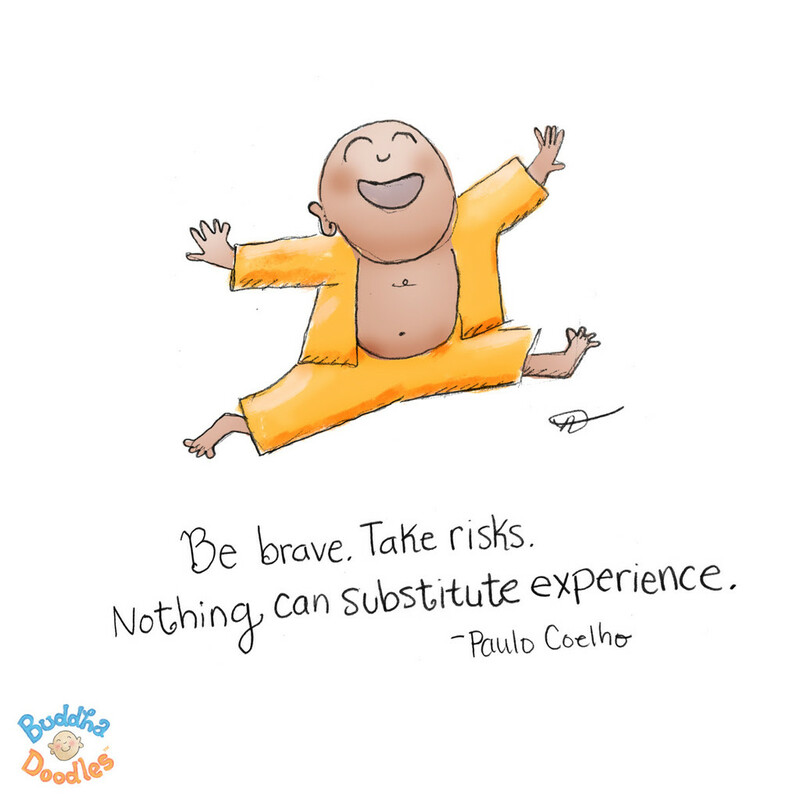 over at www.buddhadoodles.com/ I thought the following doodle was so appropriate!